So this is how it ends... not with a bang, but with a small discount. 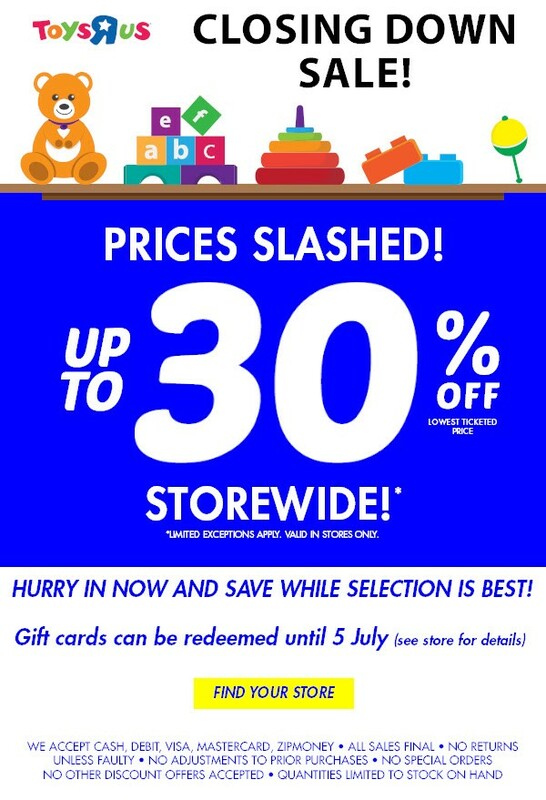 Toys R Us Australia, which you may remember announced its definite closure earlier this week, has begun promoting their 'Closing Down Sale', with discounts "up to 30%" storewide (in stores only, considering the online ordering system is already shut down at this point). 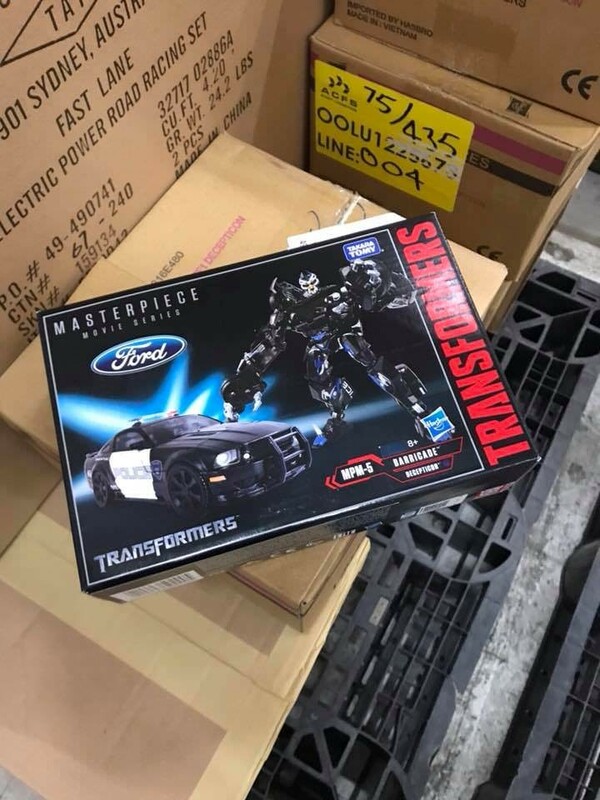 What does this mean for Transformers collectors? Well, yours truly checked a nearby store and it appears that action figures (including Transformers) are marked down by 10%. 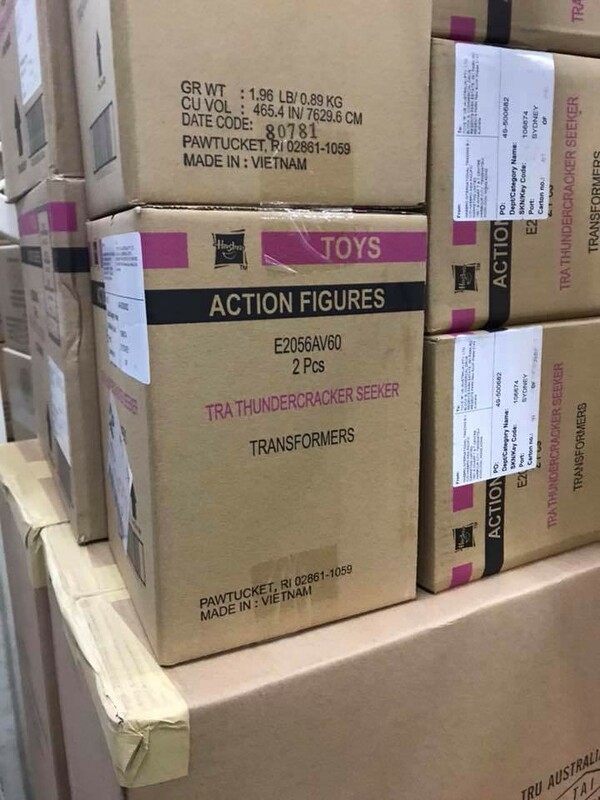 Keep in mind that this appears to be a fixed discount, not an escalating sale like US shoppers experienced; according to all available information, this is simply a flat 10% off Transformers toys presumably until all stock has been cleared out or the company closes. 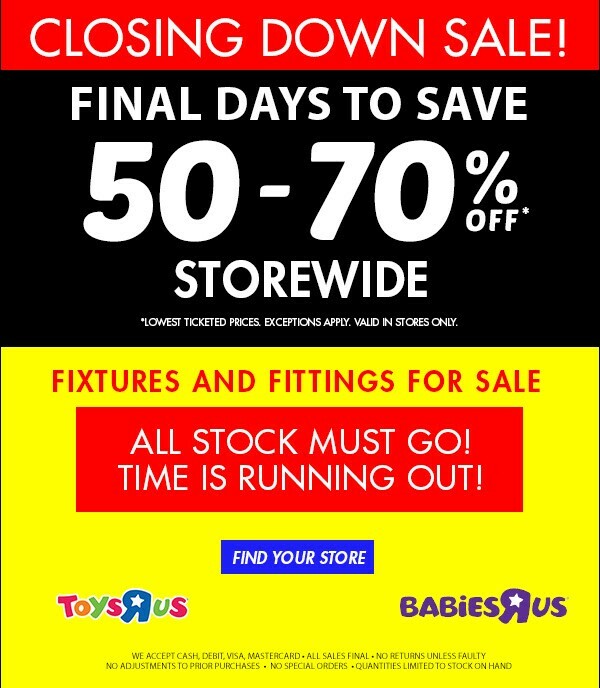 If anything changes we'll be sure to let you know, but as it stands now this seems to be Toys R Us Australia's last hurrah. Despite the gloomy subject, however, we still want to hear what you have to say: does this sale entice you in any way? Let us know by posting in the Energon Pub Forums, and stay tuned to Seibertron.com for more optimistic news in the future! Well, if I may be permitted to answer my own question: no, this sale is not enticing to me in the least. Honestly, 10% off doesn't even bring Deluxes down to a competitive price - they're still $1.50 more expensive than Big W has them for! The exact same toys as every other chain, being sold for barely less (sometimes still more) than other, more easily accessible stores. Yeah, way to clearance, TRU. Irritating to the very end. Qwan wrote: Well, if I may be permitted to answer my own question: no, this sale is not enticing to me in the least. Honestly, 10% off doesn't even bring Deluxes down to a competitive price - they're still $1.50 more expensive than Big W has them for! The exact same toys as every other chain, being sold for barely less (sometimes still more) than other, more easily accessible stores. Yeah, way to clearance, TRU. Irritating to the very end. Nothing annoy me more than entering a store with a big huge sign claiming "BIG SALE! 30% 50% 90%!!!" Only to notice that the "regular" prices have been boosted by 60% 100% 180%. I walked in, took one look, decided I'd come back in a fortnight. I don't see much TF stock moving in that time, the best I can hope for is a cheap Unite Warriors boxset. Burn wrote: I walked in, took one look, decided I'd come back in a fortnight. I'm out of the city for a couple weeks as of tomorrow, so it's possible TRU might be fully closed before I get another chance to check it out again (if their liquidation moves faster than in the US). C'est la vie... it's harder to feel bad about losing them when their final goodbye is so pathetic. Good news, Seibertronians! For a given measure of "good", at least. It seems Toys R Us Australia is indeed following suit in its closing-down sale, and periodically increasing the discounts available much like its American counterpart. 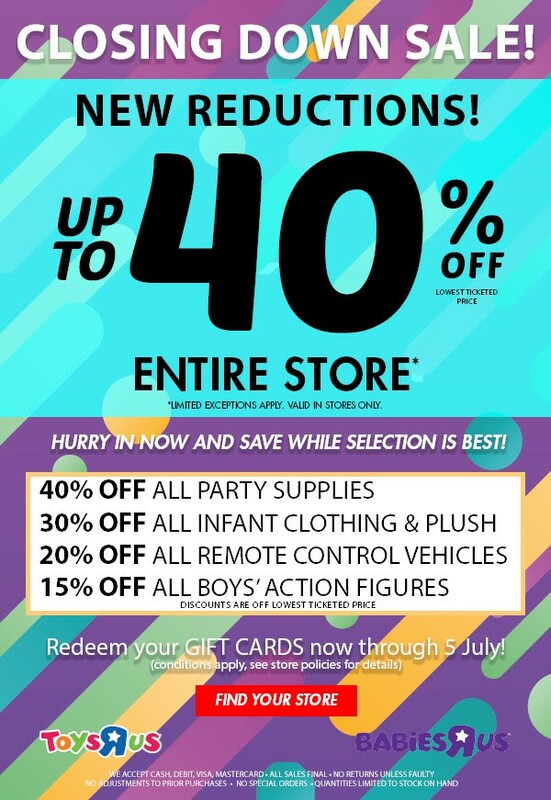 The most recent update proclaims "Up To 40%" off items storewide, which for Transformers collectors translates to a 15% discount on action figures (up from the previous 10%). 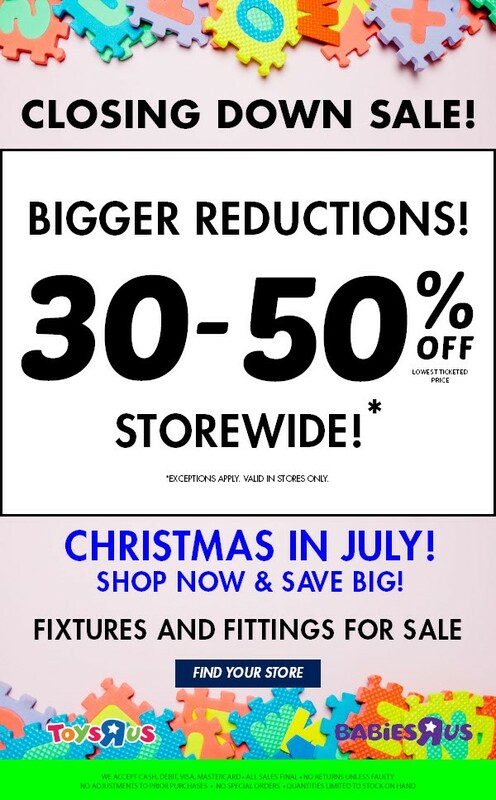 This brings all Transformers prices down to a competitive amount compared to other Australian stores, though for Deluxe and Leader figures the currently-running Big W sale is still a better deal for now. There's still no indication whether or not the sale amount will keep increasing over the coming weeks, but rest assured we at Seibertron.com will update you if and when that does occur! In the meantime, share your thoughts (or any tips for fellow collectors) in the Energon Pub Forums, and stay tuned for any other Transformers news! This seems to be moving faster than the U.S. sales. It's said that every cloud has a silver lining, but on this particular occasion it seems there are multiple silver linings to celebrate! Toys R Us Australia, as part of its own drawn-out death throes, seems to have yielded a few items of interest over the last few days. The first and most widely-applicable is yet another increase to Toys R Us' closing-down sales. 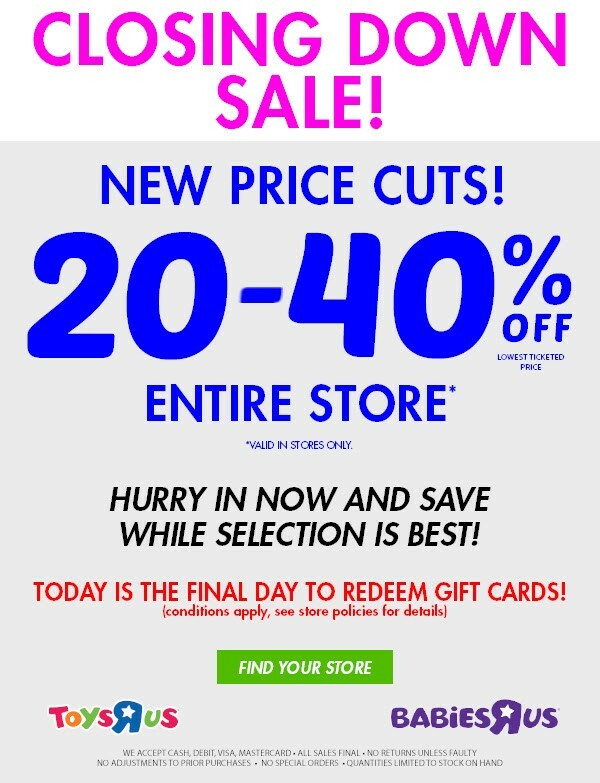 The chain now boasts "20-40% off" store-wide, and while there's no certain word on what the discount is for action figures (and thus Transformers), the pattern so far suggests that they will be riding the bare minimum of 20% off. Even so, this is a decent discount, made even more appealing given the other items of news we have to share on this topic. Indeed, it seems that Toys R Us Australia, in the process of pushing out their stock to be liquidated, has yielded two final figures for the Australian collecting market to enjoy. 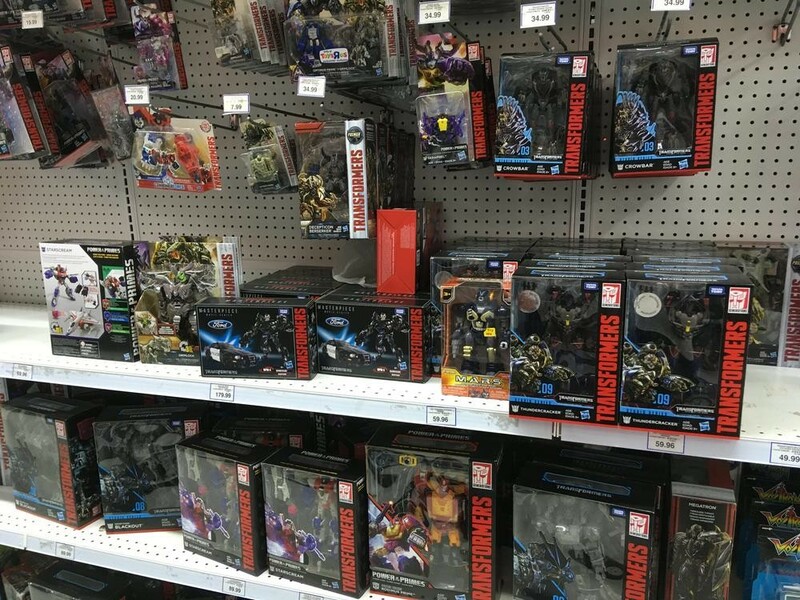 As Ozformers users Caminus Prime and Handsprime shared, it seems that Masterpiece Movie Barricade and Studio Series Thundercracker are both appearing at Toys R Us stores around the country! It's not yet clear if they will be making their way to all Toys R Us locations or just those near warehouses, but for any Australians who are interested in these two previously-unsighted-down-under figures, it might be a good idea to at least check a nearby store. It's also confirmed that the universal Transformers/Action Figure discount applies to these two as well. So, Seibertronians, does this sudden slew of relatively good news raise your spirits on the whole Toys R Us Australia subject? Share your thoughts and feelings on the Energon Pub Forums, and stay tuned to Seibertron.com for ever more Transformers news delivered straight to your screen! 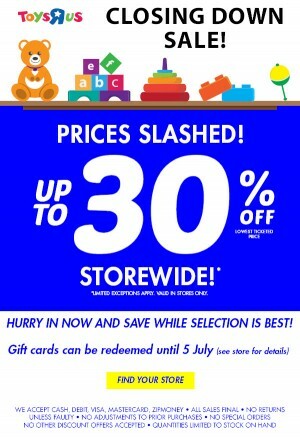 There are even bigger sales incoming for the closure of the Australian branches of now closed down storechain Toys'R'Us, as the 20-40% reductions we previously reported on has gone up to 30-50% store wide (note: only available in physical stores, cannot be redeemed online)! This also means that those recent sightings of wave 3 and wave 2 resurfacing for Power of the Primes may come in handy after all, if you can make it to a store this month. If you do so, make sure to share with other local fans your finds, and happy hunting!